A sneeze south of the Wisconsin border, a 1.7-mile racetrack snakes through the Blackhawk Farms Raceway property in South Beloit. For someone who is used to riding up and down Chicago roads akin to the surface of the moon, a racetrack sounds like the stuff dreams are made of. 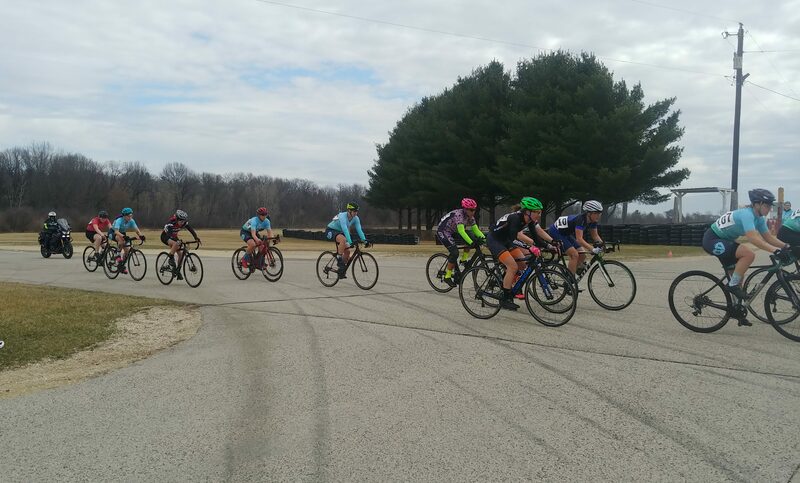 I couldn’t wait to throw down on velvety smooth pavement at the Spring Super Crit on Sunday. It was pretty decent asphalt—smooth and wide—and the weather was hovering around comfortable for the first races of the day. Due to the vast number of overlapping race categories offered, I was able to double up and race twice; especially for a race almost two hours away, the opportunity to race twice is something to take advantage of. I first jumped into the Women’s 4/5 race. Not one to show up early for races, I figured I could warm up during my first race, though there were plenty of gorgeous roadways available for a spin. Bib pickup was easy and sheltered (there were real bathrooms—with showers—too). The process couldn’t have been easier. And it was a nice touch that the host team wrote messages of support on the back of each bib. Minutes later I lined up next to my Spidermonkey teammate Kassi who was racing her first crit ever. For the second time in a week, it was super cool to see a big field welcome and applaud the numerous first-time racers. A few tips were exchanged for their benefit and for the safety of the field. The whistle blew and the pace stayed pretty hot (the 4/5 race actually ended up being faster average speed than my later 3/4, which happens—again these races are about strategy, not just speed), but the majority of the field stayed together, and despite a squeamish moment or two, everyone stayed upright. At one point I heard what I thought was a flat tire and almost pulled out of the race. Whatever was stuck on my wheel let go and I found myself in a more patient position mid-pack. This race again ended in a sprint finish. Then the Midwest did its thing…a front rolled in during the 45 minutes between my two races. I grabbed a jacket, and we were back on the line and ready to start the Women’s 3/4 race…early! (All 17 in the field were accounted for…I have never been in a race that started early before). The race rolled out cautiously as we tested corners and slick shiny pavement, but a lap or two in, the rain got serious. Riders weren’t taking many chances (especially me—not always a good idea but I sat in the back half of the field to observe). As rain pelted us, visibility was low. Water pooled at the corners and curves of the track. A couple times, someone on the front faked an attack on a straightaway but knowing the slow corners would force us to regroup, there wasn’t much response. After the races, BFF hosted a regroup/race debrief with Maria Larkin from Chicago Women’s Elite Cycling, to discuss how the races went and provide advice on some of the situations we’d come across. They also hosted a skills clinic later in the afternoon. Major props to BFF Bikes, and first-time race director Lisa Hilleren for putting on a smooth event, handling weather brilliantly, communicating event info over a loudspeaker (this was awesome), and hosting another super enjoyable race at a super splendid venue.